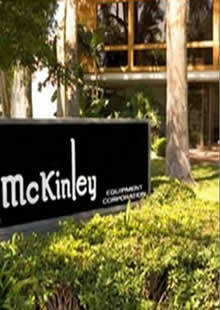 McKinley Equipment is a family-owned business headquartered in Irvine, California. The company is dedicated to being the most trusted sales and service distributor in our marketplace: loading dock equipment, commercial doors, industrial lifts and warehouse equipment. Expertise and professionalism in everything we do is how we differentiate ourselves. This allows us to attract top-notch talent to our team, which in turn benefits all our customers as they are provided value through quality from each interaction with every member of the McKinley Equipment team. World War II had ended and returning Marine officer Bill McKinley entered the materials handling field. He started his career as a salesman working for his uncle, a forklift manufacturer in Cincinnati. Having been in California with the Marines, Bill was not unlike many others in the 1940’s—to them California represented the future. 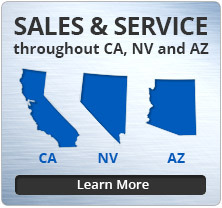 So in 1948 he returned to California to start his own equipment distribution company, and McKinley Equipment was born. By nurturing relationships with clients, word got out about Bill’s honest business approach. Additionally, he struck a deal with a new dock equipment manufacturer—The Kelley Company—to be their exclusive distributor. These points were the foundation of success for the company. By 1956, Bill decided that McKinley Equipment had to be more than just a sales firm for his booming Southern California client base. He cared that what he sold be properly installed to truly fulfill the needs of his customers. So installation personnel were added to the company to round out the offerings. 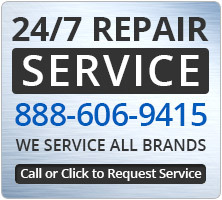 McKinley Equipment now had a reputation as a quality supplier and installer of respected, top-of-the-line manufacturers. However, there was no denying that even the best quality mechanical and hydraulic equipment needed servicing and maintenance. So the decision was made in 1960 to enter the equipment servicing business. This completed the full cycle of services by addressing customer’s needs from purchase to installation to service. Through the 1960’s, Bill’s son, Mike, could be found in the warehouse learning from the bottom up. After Mike’s college graduate degree was completed, he began work full-time with the company in 1971. During this same period, Bill could see that the focal point for business activity had shifted to the LA/Orange County line. So in 1972 he decided to consolidate the office and warehouse into a single building in Irvine, California. The company was now up to 20 employees and was poised to leverage the growth that was all around them. By the early 1980’s, solid business decisions had the company prospering. McKinley Equipment now had 40 employees. Having spent 32 years growing the business, Bill decided it was the right time to transition the business. The first decision was to exit the forklift market, and concentrate entirely on loading dock equipment and other hydraulic lifts. The second was to shift the company’s leadership to his son, as was his design all along. Bill retired having full confidence in the company’s strength with Mike McKinley as President. Mike’s philosophy for the company’s longevity was in capitalizing on new found opportunity. Focusing the company on its technical expertise, regardless of the type of product, would be the best way to leverage these opportunities. Mike defined this competency as Mechanical and Hydraulic Expertise. Mike could see the application of this expertise in many areas that would provide prospects for growth. Additionally, he knew he had some of the best experts as employees, many of whom he had worked alongside of for over 20 years. This translated into several new areas of business. The 1980’s brought new opportunities in three distinct areas of material handling and safety: material lifts (VRC’s), high speed “Rapid Roll” doors and trailer restraints. McKinley was instrumental in the public storage facility boom with material lifts and helped introduce high-speed fabric doors and loading dock safety to Southern California. All are mainstay products in today’s industrial distribution world. The 1990’s were marked by company expansion in the areas of product and territory. The Kelley Co. introduced the revolutionary FX Air Dock Leveler and the entire market changed. McKinley was fast into this new operating system, which lowered the lifetime cost of ownership. At the same time, McKinley opened its office in San Francisco and focused on wheelchair lifts and accessibility products in Northern California. Both events were instrumental in propelling future growth for the company. The expertise focus also translated into a new field of business, handicap and accessibility lifts. The customers were the same—architects, general contractors and building owners—and it was quickly becoming law to provide accessibility in public locations with the enactment of the Americans with Disabilities Act (ADA). This new field experienced tremendous growth all through the 1990’s. As before, success was primarily due to the reliable and trusting relationships that the company had built and continued to nurture. Entering the 2000’s, the addition of more complementary dock products such as overhead doors and enhanced high-speed doors continued to round out the dock equipment offerings provided by McKinley Equipment. Clients trusted the McKinley name in the past and continued to do so as they enhanced their offerings with home elevators. By the mid 2000’s, the McKinley Elevator Division was doing nearly as much business as the McKinley Equipment division. It only made sense to give each division their own identity by allowing them to operate more independently. So in 2005, McKinley Elevator was established as a sister company to McKinley Equipment with Mike McKinley as President. Greg Larsen, a McKinley family member, took over as President of McKinley Equipment, drawing on over two decades of experience with the company to continue its success. Today, each company employs about 50 loyal employees. In over 60 years of existence, McKinley Equipment has seen its share of tough economies. Every time, McKinley’s team has made it through stronger and wiser. This is largely attributed to one source—the dedicated employees who are the best in their field and the heart of the company.